Joe Brown, bass player of the Gatefolds, is the OG (Original Guest) contributor to loosehandlebars. We were friends from way back when, reconnected by the wonders of the electronic age. This year I was able to take up an invitation for a Friday night round the Browns’ place & the time passed since we had last met meant nothing. When Joe talks about music & many other things it’s good to listen. “Sometimes I Sit & Think, Sometimes I Just Sit” is a great title for a record & “Elevator Operator” a top notch opening track. Melbourne singer/songwriter/guitarist Courtney Barnett took her time before releasing her fine debut LP. She’s spent time in a grunge band & made some psych-country (sounds good). Her own songs are sung with sweet vocals & contain sharp, smart lyrics . Musically there’s a drive & focus that brings a fresh energy to punchy guitar rock. Check “Dead Fox” with its take on the Velvet’s “Rock & Roll” riff. Courtney Barnett, one to listen to & to watch out for. Next up has to be Moon Duo & the ” Shadow of the Sun” LP. “Slow Down Low” was the feelgood hit of the summer, an anthem for some of us in Derry. What started as a Ripley Johnson side project is 5 albums along, has a real drummer & has got it going on. We got to see them earlier in the year at a psychedelic arts/music festival about 20 miles outta town, a great night where we teamed up with some friends from the past, Bernard Griffin and Mickey Rooney who was our driver for the night. He kindly volunteered & will remember more of the journey home than I will though hopefully not everything ! 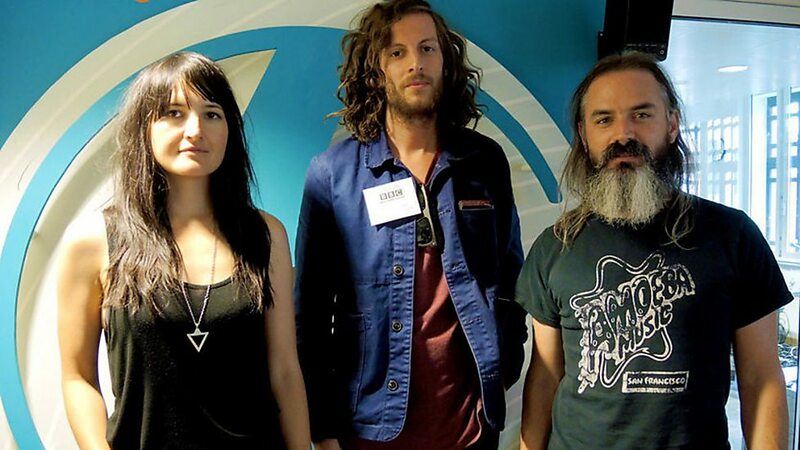 Now we have to see Wooden Shjips, the psych-drone mothershjip that Moon Duo call home. No apologies for selecting the Nottingham duo Sleaford Mods..the Marmitemen (seems you either love ’em or hate ’em). The voice of some of the people. There’s a place for Manic Expression. It’s not always on the High St, outside the charity shops, the betting shops & that place that used to be Woolworth’s. Like Mark E Smith & John Cooper Clarke before him Jason Williamson’s rants hit the nail on the head about some stuff that needs to be said. “Key Markets” is their 8th LP, the beats go on. Who knows what shelf life is in these lads. That bloke shouting as security escorts him from the Jobcentre makes some sense but if he’s there every time…A couple of years ago my friend Kevin Magee promoted a Mods’ gig which was missed by Derry’s entire population minus eight. If there is to be a next time then I’ll be one of the Jolly Fuckers down the front. Thanks Joe. There will be more to follow about the man & his music in my own highlights of the year. Personally I can’t wait. It’s that time when a hand-picked band of friends of loosehandlebars are invited to contribute their own musical highlights of the past year. First to the plate is Danny McCahon, a champion of Scottish music & whose support of this blog is much appreciated. Danny’s radio drama “A Lulu of a Kid”, about the early days of the Glasgow chanter, is to be broadcast on Xmas Day by BBC Radio Scotland. It will also be in your computer on the “listen again” feature so don’t miss it. It’s all new music if you’ve never heard it before, right? That’s been my attitude this year, anyway, as I learned loads of stuff including that Idlewild don’t play the folkie tunes their name had led me to expect. So, my chosen highlights for 2015 all have a whiff of history about them. No nostalgia, though. Although I love old stuff, I’m not keen on nostalgia. First up is a band that coulda, shoulda, woulda been Glasgow very own Rolling Stones. 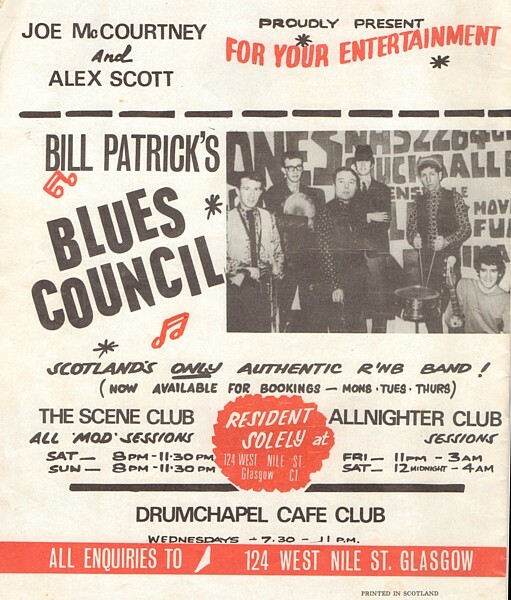 I’d never even heard of them until my day job had me trawling through accounts of the Glasgow music scene in the sixties. This name kept cropping up: The Blues Council. People whose opinions I trust all seemed to have good words for them and the Sensational Alex Harvey’s brother, Les Harvey, was in them. I had to investigate. But they made only one single and, now that it’s a floor filler on the Mod scene, I can’t afford a copy. The group was formed by former ballroom band leader Bill Patrick, with Billy Adamson on drums, Fraser Calder on vocals, James Giffen on bass, Leslie Harvey on lead guitar, John McGinnis on piano with Larry Quinn and Patrick playing saxes. 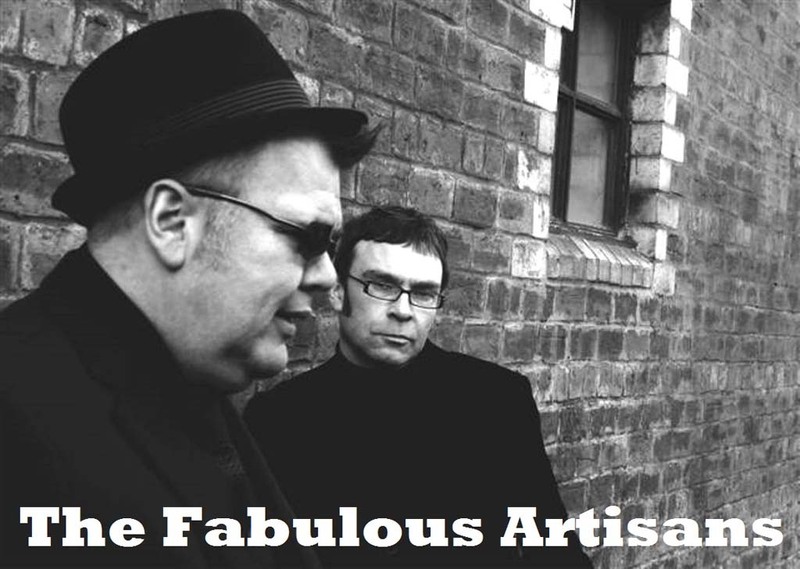 They created a buzz and established a solid and loyal following as house band at The Scene Club in their home town and were quickly snapped up by Parlophone. But after one single ‘Baby Don’t Look Down’/‘What Will I Do’ on the way home from a gig on 12 March 1965, their van was in a crash and Fraser Calder and James Giffen died. There was a short-lived new line up but they never made any more records. I loved their one record when I found it on YouTube. Especially B Side What Will I Do. It’s easy to get to Edinburgh from my house. Out the front door turn left, first left, fourth on the right and keep going until you run out of M8. But I lost the habit of going to gigs there round about the mid-eighties. Seventy-five miles is a fair distance when it comes to accent and culture. So, I had never heard of The Fabulous Artisans until a few weeks ago when I went to see Glasgow’s finest James King and the Lonewolves (who I hope to tell you more about next year if our editor will allow me the space) headline a revue featuring artists from Stereogram Records (who I’d like to tell you more about next year if our editor will allow me the space). Anyway, this larger than life man in a dark suit with a voice that swamped even his stature and had such depth it rendered his suit pale, completely took me by surprise. In the best possible way. This was Neil Crossan, the singer in The Fabulous Artisans. Apparently Neil and his writing partner Jeremy Thoms put the band together in 2007 and plucked their name from the Orange Juice catalogue. Despite having bought three albums ion the way in, I tried to buy the Fabs album on the way out. But they don’t have one. Yet. My third pick which – in true talent show fashion, listed in no particular order – is much closer to home. In my home town of Greenock, in fact, and featuring one of our own sons. I liked Pulp when Blur and Oasis were fighting it out for the Britpop lightweight championship of the charts, so I wasn’t really paying attention when my hometown had its own band of cheeky wee upstarts in stripy T shirts and floppy hairdos. But I was missing a trick, because Whiteout were a better than decent band and their lead guitarist, Eric Lindsay, was a better guitarist than Britpop deserved. I picked up on their debut album years later and, by chance, became friends with Eric. Eric’s bid for pop stardom had cost him a few quid and he was now bringing up his family on the wages of a modern languages teacher. But, of course, he was still playing. Filling pubs and clubs with shifting lineups of friends and acquaintances. An annual gig between Christmas and New Year became a favourite on the local social calendar. And, as guitarist in Joe (Superstar) McAlinden’s band Linden, he’s been making some fantastic music these past couple of years. But Eric has his own songs that deserve to be heard. And he got serious again in 2015. With singer Lynnie Carson he started gigging again, using his old band name Eli. Eric describes their live set as being full of ‘songs that touch on the great opposing themes of life’. Songs about lost and lasting love, of faith and infidelity, of alienation and universal connectivity. One of my happiest memories of 2015 is sitting in a local bistro, my belly full of good food and a healthy serving of alcohol, with my wife and some of our very best friends listening to Eric and Lynnie giving Eric’s tunes an airing. Life doesn’t get better than I felt that night. They’re a humble pair and don’t appear much on the internet, but this snippet from an earlier gig will give you a glimpse of why I think Eric deserves to be more than just the best musician on his school’s staff. It’s all new music if you’ve never heard it before, aye? Great stuff Danny. He & I exchange thoughts, words & music electronically at the moment. Early in 2016 we should be in the same place at the same time for the Everlasting Y eah gig at the Lexington in London. So…that’s one of next year’s highlights sorted then eh…I said eh ! I recently received, from a cousin, a small collection of old family photographs. The black and white images of my late parents’ wedding always invoke strong & wonderful memories. As their oldest child, born just 6 months after this occasion (a-hem ! ), I can remember this young, striking couple, optimistic that their life together in the post-war 1950s would be a material & social improvement on their childhood experience of economic depression & war. The cache also includes photos & a couple of pages from a scrapbook from 4 years earlier when Dad was an outstanding teenage track athlete, winning 4 County titles at youth level. I don’t know which member of his family had cut out & collected these local press clippings, there was obviously pride in his achievements. My father continued to compete throughout the next decade & I have many summer memories of watching him run. My sister & I are the only ones still around from that time so maybe it’s time to write them here before there is no-one left to remember them. In 1949 Dad was 18 years old & became the National Junior Champion at 440 yards. The one lap sprint is a tough race & when he entered his 18 months of National Service (compulsory for males between 17-21) he won championships in the shorter sprints. On returning to England his most notable success was back over the longer distance when, in 1954, now married & a father of 2, he won the North of England title. I once asked him why he stopped running the 440 & he told me that it was just too bloody hard ! He trained, 2 evenings a week, at the well appointed sports ground of the steel company where he was employed & I was often taken along. I did what I could to help, carefully carrying the spiked running shoes but not the lightweight steel starting blocks he used, they were still too heavy & bulky for me. I could join the small group in their warm-up exercises & the best part, probably the reason I was there, assisted on their practice starts. Unfortunately I was not given a pistol. It was “on your marks…set” then I slapped together a pair of plywood clappers. No-one started until I did my thing. Over 30 years later I was back on that field playing cricket in the works league. The same summer sunlight, the same long shadows of the trees were a reminder of those times with Dad & his friends. There were race meetings across the North of England all summer long back then. Our family travelled by coach with the other local athletes. While Dad prepared for his race I watched the other heats of his event. The races were handicapped & Dad was always at the back of the field. The combination of a young flyer with a favourable handicap could be dangerous. Down at the start of the final I passed on the intel, wished him luck then made my way to the finish line at the other end of the straight. Man, he was strong & powerful & fast. He didn’t always win, though it seems to me that he usually did. As we walked back together after the race I was probably more aware of the applause from the, often large, crowd than he was. It’s cool to hang out with the winner. Of course this was an amateur sport & no money changed hands. Our house was full of trophies & prizes that he had won, clocks, canteens of cutlery & a couple of Fabulous Fifties bakelite picnic hampers that would be the very thing to have now. Everyone loves a picnic & Mum set the bar for alfresco alimentation pretty high. We sat trackside, cheering on our friends, filling up on hard-boiled eggs, sausage rolls & potted meat sandwiches. Life was good. In 1958, when I was 5, my Dad, my godfather Tom White & myself crossed the Pennines for the Northern Counties Championships in Manchester. “Uncle” Tom was Dad’s coach & mentor, a National Champion at 880 yards he had competed in the Olympic Games in London (1948) & Helsinki (1952). I pestered him for details about his great international adventures & he was always considerate of this pesky kid. Dad’s win, 4 years earlier, was engraved on to the biggest trophy on show…impressive. We saw Derek Ibbotson, the then holder of the world mile record, a blue riband event after Roger Bannister had broken the 4-minute barrier for the distance in 1954. Dad called him over & this international star, glowing with fitness & celebrity, in an Olympic issue Great Britain tracksuit (he was a bronze medallist) , approached us for a chat. I was introduced & he shook my hand. I was speechless, my jaw still on the floor from this new information that a sporting hero actually knew my Dad’s name ! The following year the same crew hit the road for the longer journey to the National Championships. My first visit to that London, first time in a large, crowded sports stadium. We had no family car & the journey down the Great North Road, me in the back seat, listening to the men talk up front, was exhilarating. My over-excitement & curiosity (I was a curious boy !) possibly stretched their patience but I knew not to push it. This was too good a time for a motor-mouthed, indefatigable little kid to blow. I’m sure Tom & Dad were relieved when my energy finally ran out & I slept all the way home. By 1960 there were 4 children in the family & Dad was busy at the steel plant, working with the asbestos fibres which invaded the lungs in his barrel chest, undoubtedly contributing to his early passing. There was less time to train & he was unlikely to maintain the form of his youth. He competed in fewer track meetings. There was also the attraction of his winter sport. Rugby is a team sport, on-field bonds of trust & friendship extended beyond the touchline. Our local club benefitted from his energy & enthusiasm long after his playing days were over. Dad had said that he would retire when he had played with his oldest son (that would be me). When that thing happened, (how great was it to have your Dad looking out for you on a rugby pitch ? ), our house was a quieter place for the rest of the week. As a teenager I had my own spiked shoes & pestered my reluctant Dad to assist our school athletics team. Our star sprinter was surprised when he would be busting himself while the trainer jogged alongside him barking out instruction. If Dad could not make the full session he would hand out our schedules, telling us that he didn’t care if we cheated on them, we would only be cheating ourselves. We had been told ! It worked, our performances improved & other athletes asked to join the most organized group on the track. The mellifluously named Melody, 19 & the fastest female in town, was, I hope, amused by her new gaggle of 14 year old admirers ! In later years I loved to watch televised track & field with Dad. On his own TV debut he had been disqualified for 2 false starts. Mum, watching on a neighbour’s set, was in tears. His expertise & his delight in exceptional performances were informative & inspirational. We attended a meeting in London, an opportunity to admire Britain’s great middle distance runners Cram, Coe & Ovett. At a Northern Championships I encountered an old friend who introduced Dad to some of the competitors. He was always happy in the company of young athletes whatever their sport. Watching him in animated conversation with the winner of the 400 metres, the same title he had won 40 years earlier, was just a gas, gas, gas. I understand that these memories are rose-tinged. We had our differences, he was my Dad, it’s his job. The strong-legged, fast-twitch runner he was is an important part of carefree, endless summer childhood memories. Now, there’s an empty chair in the room when I watch the Olympics or the World Championships. I know that he would be appalled at the drug-fuelled disgrace of athletics while loving the unique abilities of Usain Bolt. I know that he would be telling it like it is. Sport…it’s something me & my Dad did.